When painter Jo Baer shows people her 1991 painting Of a Fearful Symmetry (Bound Hand and Foot), European viewers immediately identify the tall, taut leather boots that hover near the center of the canvas as those of a Gestapo member. On the other hand, Baer explains in a short film about her work that was screened at Hunter College on Monday evening, "Americans say, 'Cool riding boots.'" Baer, for the record, has been among Europeans for most of the past 35 years, having left New York at the height of her success, in 1975, for a castle in Ireland and then a home in Amsterdam. She was a rare phenomenon when she lived in the United State: a young female artist selling paintings and earning a mid-career retrospective at the Whitney at a time when the art world was something less than friendly to female artists. Now in her early eighties, she is still painting, though her European work, which has occupied nearly half of her life — and more than half of her career — is almost never shown on these shores. (A 2007 Alexander Gray Associates show is a notable exception.) We know the optimal magic and quiet warmth of her minimal work, but the rest of her practice remains something of a mystery. It was no surprise, then, that the crowd that arrived to watch her film and listen to her in conversation with curator and director of The Artist's Institute Anthony Huberman filled every seat in a large auditorium at the school's Upper East Side campus. When questioned by an audience member about her experiences as a woman in the art world, though, Baer demurred from the role of activist. “I'm not the one to ask,” she said. “The feminists called me a female man.” She is from a line of independent woman, she explained, dating back at least as far as one of her grandmothers, who supported the family by selling life insurance, in 1901. However, she said that, despite her success selling paintings, male collectors sometimes returned them when they learned that "Jo" was a woman. In Europe, she shifted steadily from meticulous geometry to a rich variety of imagery, painting mythical figures, humans, symbols, and artifacts as she relearned how to paint. 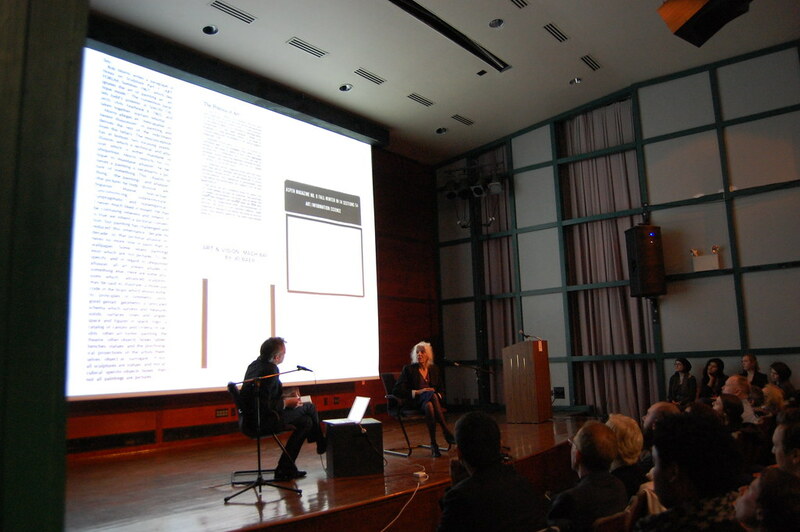 New York Times art critic Roberta Smith, speaking from the audience, pointed out that Baer's transition in the mid-1970s occurred just as Frank Stella, Elizabeth Murray, Francesco Clemente, and others were making radical changes in their own painting practices. Baer agreed, expressing admiration for Clemente and early Schnabel and adding that a similar process was occurring in parts of Europe, where, for example, "the Germans really wanted to be expressionists again." Just as painting was enduring the first of what would be many pronouncements of its death from a certain segment of the art world, artists in another segment were working to revive it, finding fecund new possibilities. "The sculptors got into gear and got the propaganda machine going," Baer said, describing the atmosphere of the moment. She paused, and what looked to me like a faint smile flickered across her face. "They were really bad painters," she said.